Ovast, við klokkuni: Amerikanskar herdeildir á goymistaðnum hjá Uday Hussein og Qusay Hussein; uppreistrarfólk í Norðurirak; ein irakiskur uppreistrarmaður skjýtur MANPADS; niðurtøkan av Saddam Hussein standmyndini á Firdos Plássinum. ** Total deaths include all additional deaths due to increased lawlessness, degraded infrastructure, poorer healthcare, etc. Irak-kríggið var ein langdrigin bardagi, ið USA stóð á odda fyri, og vardi frá 20. mars 2003 til 18. des. 2011. Bardagin byrjaði við at ein samgonga av nógvum londum við USA á odda stóðu saman um at gera innrás í Irak í mars 2003. Tað eydnaðist teimum sameindu herdeildunum at koppa stjórnini hjá Saddam Hussein og Baath-flokkinum. Saddam Hussein hevði tá verið forseti í Irak síðan 1979. Kríggið vardi tó í meira enn 10 ár, av tí at uppreistrardeildir í Irak bardust ímóti teimum sameindu herdeildunum og móti tí nýggju stjórnini. Umleið 151.000 to 600.000 irakar ella fleiri lótu lív undir innrásini og tey næstu 3-4 árini. USA tók seg alment út úr Irak í 2011, og tá endaði kríggið. Men síðan hevur borgarakríggj valda í Irak og í 2014 gjørdist USA aftur partur av stríði í landinum í 2014 og var tá á odda fyri einari nýggjari samgongu í einum kríggi, ið enn gongur fyri seg. Í 2005 varð nýggj grundlóg samtykt í Irak, soleiðis, at landið fekk fólkaræðisliga stýrisskipan. Meðan Hussein hevði valdið varð landið skipað sum fullkomiligt einaræði, og meðan hann stýrdi, mátti irakiska fólkið, serliga kurdarnir, tola nógv. Stjórnin fekk stuðul frá herinum og trygdarløgregluni, sum bardu niður alla politiska mótstøðu í landinum. Innrásin í Irak byrjaði eftir at Saddam Hussein hevði fingið eitt ultimatum um at fara úr landinum. Innrásin byrjaði við einum "shock and awe" bumbuálopi. Irakiskar herdeildir vóru skjótt yvirmannaðar og herdeildir hjá USA fóru inn í landið. Ba'atist stjórnin varð feld og Saddam Hussein varð fangaður í desember 2003 og avrættaður trý ár seinni av einum hernaðardómstóli. Tómrúmið ið uppstóð eftir Saddam Hussein og vánalig leiðsla av tí bráðfeingis stjórnini ið varð sett av teimum sameindu herdeildini, førdi til harðskap, ið av summum journalistum verður nevnt borgarakríggj, í Irak í 2006-07, har harðskapur varð framdur av Sunni og Shi'a trúarbólkum. Harumframt varð eisini uppreistur ímóti USA og teimum sameindu herdeildunum ið vóru í landinum. Harðskapurin førdi til, at USA økti munandi um herdeildir sínar fyri at veita trygd til Baghdad og Al Anbar landlutin. Á vetri 2007-08 byrjaði USA at taka herdeildir sínar úr Irak, og eftir at Barack Obama gjørdist forseti í USA kom ferð á afturtøkuna av amerikonskum herdeildum úr Irak, til teir at enda heilt fóru úr landinum í 2011. ↑ President Barack Obama Speaks With VICE News. YouTube. 16 March 2015. ↑ "Operations By Iran's Military Mastermind - Business Insider". Business Insider. 9 July 2014. http://uk.businessinsider.com/operations-by-irans-military-mastermind-2014-7?r=US&IR=T. ↑ "Sectarian divisions change Baghdad's image". MSNBC. 3 July 2006. http://www.msnbc.msn.com/id/13684759/. Heintað 18 February 2007. ↑ 5.0 5.1 5.2 "The JRTN Movement and Iraq's Next Insurgency | Combating Terrorism Center at West Point". Ctc.usma.edu. https://www.ctc.usma.edu/posts/the-jrtn-movement-and-iraq%E2%80%99s-next-insurgency. Heintað 2014-08-02. ↑ "UK 'to continue deporting failed Iraqi asylum seekers'". BBC News. 22 November 2010. http://www.bbc.co.uk/news/uk-politics-11816974. Heintað 26 November 2010. ↑ "Iran expands regional 'empire' ahead of nuclear deal". Reuters. http://www.reuters.com/article/2015/03/23/us-mideast-iran-region-insight-idUSKBN0MJ1G520150323. ↑ "Chaos in Iraq under US-Iran hegemony - Iraq - Worldbulletin News". World Bulletin. http://www.worldbulletin.net/nouri-al-maliki/141393/chaos-in-iraq-under-us-iran-hegemony. ↑ "How to Stop Iran's Growing Hegemony - National Review Online". National Review Online. http://www.nationalreview.com/corner/416770/how-stop-irans-growing-hegemony-mario-loyola. ↑ "Al-Qaeda's Resurgence in Iraq: A Threat to U.S. Interests". U.S Department of State. 5 February 2014. http://www.state.gov/p/nea/rls/rm/221274.htm. Heintað 26 November 2010. ↑ "Operations By Iran's Military Mastermind - Business Insider". Business Insider. 9 July 2014. http://www.businessinsider.com/operations-by-irans-military-mastermind-2014-7. ↑ "A Timeline of Iraq War, Troop Levels". The Huffington Post. http://www.huffingtonpost.com/2008/04/07/a-timeline-of-iraq-war-tr_n_95534.html. ↑ "Deputy Assistant Secretary for International Programs Charlene Lamb's Remarks on Private Contractors in Iraq". U.S. Department of State. 17 July 2009. http://www.state.gov/m/ds/rls/rm/143420.htm. Heintað 23 October 2010. ↑ Rubin, Alissa J.; Nordland, Rod (29 March 2009). "Troops Arrest an Awakening Council Leader in Iraq, Setting Off Fighting". The New York Times. http://www.nytimes.com/2009/03/29/world/middleeast/29iraq.html?hpw. Heintað 30 March 2010. ↑ "The Kurdish peshmerga forces will not be integrated into the Iraqi army: Mahmoud Sangawi — Interview". Ekurd.net. 22 January 2010. http://www.ekurd.net/mismas/articles/misc2010/1/independentstate3441.htm. Heintað 23 October 2010. ↑ "Iraq War". U.S. Department of State. http://fpc.state.gov/documents/organization/77707.pdf. Heintað 18 November 2012. ↑ "Operation Iraqi Freedom". iCasualties. http://icasualties.org/Iraq/index.aspx. Heintað 24 August 2010. ↑ "Home and Away: Iraq and Afghanistan War Casualties". CNN. http://www.cnn.com/SPECIALS/2003/iraq/forces/casualties/index.html. Heintað 30 March 2010. ↑ "POW and MIA in Iraq and Afghanistan Fast Facts". CNN. http://www.cnn.com/2013/10/30/world/pow-and-mia-in-iraq-and-afghanistan-fast-facts. Heintað 5 June 2014. ; As of July 2012, seven American private contractors remain unaccounted for. Their names are: Jeffrey Ake, Aban Elias, Abbas Kareem Naama, Neenus Khoshaba, Bob Hamze, Dean Sadek and Hussain al-Zurufi. Healy, Jack, "With Withdrawal Looming, Trails Grow Cold For Americans Missing In Iraq", The New York Times, 22 May 2011, p. 6. ↑ "Casualty". U.S. Department of Defense. http://www.defense.gov/NEWS/casualty.pdf. Heintað 18 November 2012. ↑ 31.0 31.1 iCasualties.org (was lunaville.org). Benicia, California. Patricia Kneisler, et al., "Iraq Coalition Casualties"
↑ 32.0 32.1 "Defence Internet Fact Sheets Operations in Iraq: British Casualties"[deyð leinkja]. UK Ministry of Defense. Latest combined casualty and fatality tables[deyð leinkja]. ↑ 34.0 34.1 "Office of Workers' Compensation Programs (OWCP) – Defense Base Act Case Summary by Nation". U.S. Department of Labor. http://www.dol.gov/owcp/dlhwc/dbaallnation.htm. Heintað 15 December 2011. ↑ 35.0 35.1 T. Christian Miller (23 September 2009). "U.S. Government Private Contract Worker Deaths and Injuries". Projects.propublica.org. http://projects.propublica.org/tables/contractor_casualties. Heintað 23 October 2010. ↑ Moore, Solomon; Oppel, Richard A. (24 January 2008). "Attacks Imperil U.S.-Backed Militias in Iraq". The New York Times. http://www.nytimes.com/2008/01/24/world/middleeast/24sunni.html?_r=1&pagewanted=print. ↑ Greg Bruno. "Finding a Place for the 'Sons of Iraq'". Council on Foreign Relations. http://www.cfr.org/iraq/finding-place-sons-iraq/p16088. Heintað 26 December 2011. ↑ Press release (28 October 2003). "New Study Finds: 11,000 to 15,000 Killed in Iraq War; 30 Percent are Non-Combatants; Death Toll Hurts Postwar Stability Efforts, Damages US Image Abroad"[deyð leinkja]. Project on Defense Alternatives (via Common Dreams NewsCenter). Retrieved 2 September 2010. ↑ "Amnesty: Iraq holds up to 30,000 detainees without trial". CNN. 13 September 2010. http://articles.cnn.com/2010-09-13/world/iraq.detainees_1_detainees-iraqi-authorities-moussawi?_s=PM:WORLD. Heintað 6 January 2011. ↑ "Iraq Body Count". http://www.iraqbodycount.org/. Heintað 27 April 2014. 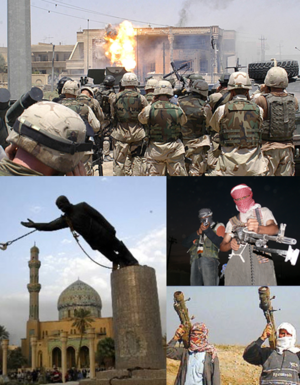 ↑ "Iraq War Logs: What the numbers reveal". Iraq Body Count. http://www.iraqbodycount.org/analysis/numbers/warlogs/. Heintað 3 December 2010. ↑ Kim Gamel (23 April 2009). "AP Impact: Secret tally has 87,215 Iraqis dead". Fox News. http://www.foxnews.com/printer_friendly_wires/2009Apr23/0,4675,MLIraqDeathToll,00.html. Heintað 26 April 2014. Hendan síðan var seinast broytt 16:05, 25. feb 2017.